Passed peacefully away on Thursday, November 22, 2018, Annie Hall Stevenson in her 98th year. Predeceased by husband Lorenzo (1985). Leaving to mourn son Peter (Susan Walsh); step grandchildren: Amanda Peddle (Gerald), Allison McGrath (Andrew); step-great-grandchildren: Nolan and Riley Peddle; sister-in-law Ena Parrott (James deceased); special nieces: Linda Sprague, Beverly Norman, Janet Reid, Phyllis Walters, Elizabeth Stevenson, Doreen Noel, Rose Calvert, Margaret Gosse (deceased) and their families; nephews: Rod Nicholl, Fred Nicholl, David Nicholl (deceased) and their families; special friends Mabel Hatcher and Mary Corbin; and many other friends. 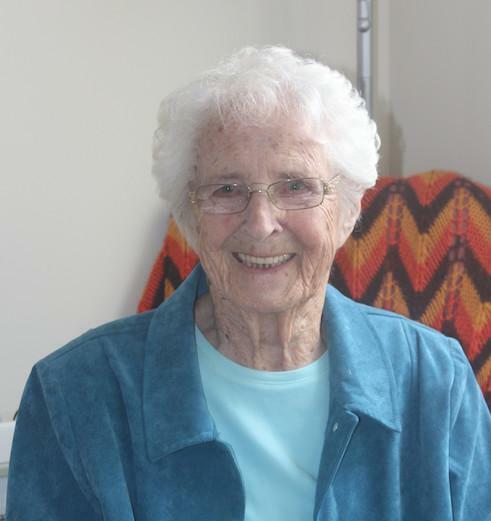 Annie was a long-time member of the Altar Guild at All Saints Church, Corner Brook, Ladies Auxiliary Western Memorial Hospital and Canadian Girl Guides Association. Thank you to the staff at Tiffany Village for their care over the past four years. Resting at Fillatre’s Funeral Home, 4 St. Mark’s Avenue, Corner Brook on Monday, November 26th from 2-4 and 7-9 pm and Tuesday, November 27th, 10-12 am. Funeral to take place on Tuesday, November 27th at 2:00 pm from the All Saints Church, Corner Brook. Interment to follow at Mount Patricia Cemetery. In lieu of flowers, donations may be made in Annie’s memory to All Saints Anglican Church, 44 Clarence Street, Corner Brook, A2H 1K9. The family guest book may be signed by visiting www.fillatre.ca.